I often get asked how to work remote jobs as a busy parent. This is a fair question, and one I once struggled with too. What’s a busy parent to do? The short answer? Work remote! In the fifth annual Cost of Care Study, it was found that one in three families spend 20% or more of their total yearly income on childcare. For many, this amounted to more than $200 a week. When you’re making between $10-$20 an hour, this is a substantial chunk of change. As a mom to be, I knew how expensive childcare was in my area. Instead of sacrificing nearly half of my paycheck (and 40+ hours away from my little one a week), I opted to work remote jobs to spend more time with him and keep more of my hard-earned money in my pocket. Unfortunately, deciding to work remotely and actually finding remote work are two very different things. The good news is, in the ten years since I’ve started my work-from-home journey, I’ve learned a lot about telecommuting as a parent. So much so that I found there are 4 things you have to know to work remote jobs as a parent. You can search for work from home jobs all day long. In fact, you can find hundreds and hundreds of remote job leads every single day. But, they won’t do you any good if you’re not looking for the right types of jobs. One of which is better suited for busy parents than the other. First up, let’s look at employee positions. Companies like Amazon, American Express, and Apple all hire remote employees. These workers are employees of these companies and are expected to work a set schedule with set hours. 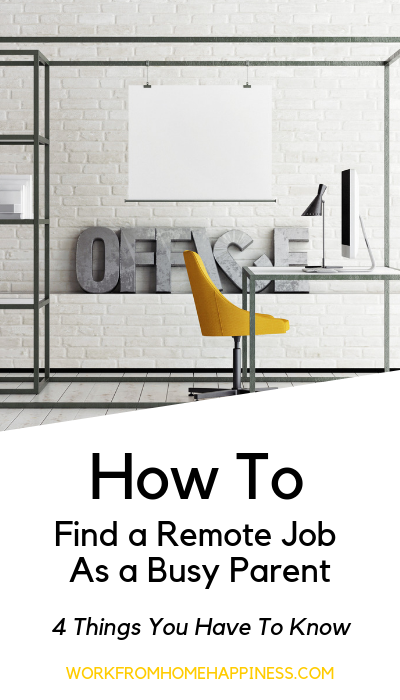 Basically, remote employee jobs are just like office jobs but instead of sitting in a cubicle, you get to work from your home office. As a busy parent with little ones in your care, employee positions often don’t work out. It’s impossible to keep a baby quiet during an eight-hour shift just as much as it is to keep toddlers entertained while you’re trying to get your work done. You just can’t be a parent who’s also on the clock at the same time. It just doesn’t work out. Now, if you’re the parent of older, school-aged kids, you might be able to work remote part-time jobs as an employee. During those 6 or 7 hours your little one is at school, you could devote several of them to work remote jobs. Of course, this only works out if you can afford to work part-time and actually have part-time availability while your kids are at school. But, keep in mind, this isn’t always practical. After all, kids have various days off from school throughout the year for holidays and teacher planning. Plus, many schools let out for the summer. During these times, you’ll have to plan and pay for childcare, which can make it difficult to work from home, even part time. But, if you do have a desire to work part time and don’t mind planning childcare throughout the year when school is out, I highly recommend you check out FlexJobs for information on part-time jobs you can do from home. With a paid membership, you get access to real job leads that are 100% guaranteed to be spam free. The other main type of remote work you can find as a parent falls under the freelance umbrella. As a freelancer, you sell your skills or services to clients. You get to set your hours, pick the projects you work on, and negotiate your own pay rate. Essentially, you are your own boss. The flexible nature of freelance work makes it highly attractive as a parent. In fact, that’s exactly how I got my start. After my son was born, I started a freelance writing career from scratch. This allowed me to stay at home with him and earn money around his schedule. Without freelance work, I would have ended up putting him in daycare while I worked a 40-hour office job. Freelancing was, in a word, lifesaving. To be successful as a freelancer, it’s best to focus on one skill or service to start and build from there. For me, I chose writing because it was something I always wanted to do and genuinely enjoyed. I suggest you too go after a skill you already have and can develop into a profitable service-based business. Remember, it can take time to get established as a freelancer. But, once you do, your income potential is limitless and you can work whenever and wherever you can. This is often the most important factor for busy parents who want to work remote jobs — flexibility! I was shocked to learn that most workers have no clue what they need to earn to make ends meet each month. But then it hit me, I had no idea either. As a busy parent who wants to work remote jobs, it is important for you to understand how much you actually need to make. After all, you’ve got mouths to feed beside your own and remote work won’t do that unless you’re actually earning enough to survive. Too often we get caught up in finding remote work, that we don’t actually think about what we need out of a remote job. Sure, you might want the flexibility to be both a parent and breadwinner, but how much cheddar do you need to earn? Thankfully, you can figure it out pretty easily. The figures they provide are based on annual expenses a family would have. This includes things like food, housing, medical costs, etc. There are even recommended earnings for those who only want to work part time. Use this calculator to guide you in your pursuit of remote work. There’s no sense in pursuing work from home jobs that don’t even come close to paying you what you need to survive! We tend to think we have more time than we actually do. That’s why we end up overworked, double-booked, and feeling like there just aren’t enough hours in the day to get everything done. Often, the solution isn’t more time but better clarity. Many of us lack time awareness and set false expectations of what can get accomplished in a day. I offer career coaching services for those who want to work from home but have no idea where to start. A recent client of mine, a mother of two, knew she wanted to work remote jobs. She also knew that she needed to earn about $1,400 a month to contribute to her household. As part of our initial interview I asked her how much time a week she could spend on her job. She very knowingly declared she could commit 20 hours to her remote work every week. I crunched the numbers and determined she had to earn about $18-$20 an hour to hit her target monthly income. We put together a great resume. Set up a service site for her as a freelancer. And lo and behold, she landed her first client who needed someone part-time, 20 hours a week, and would pay $20 an hour. How’s that for a win? But, as she began working for her client, she quickly became overwhelmed with the demands of her work coupled with raising a family. When I checked in with her after a month, she told me she couldn’t do it. She said there were just not enough hours in the day to get everything done and that both her work and family life were suffering as a result. This of course was not the outcome we worked toward. The whole point of working remotely as a parent is to earn money and spend time with your kids. So, what went wrong? The short answer, she had false expectations. You see, we all tend to assume that we should be able to do everything we want to do. But this is simply unrealistic. There are only 24 hours in a day. No matter how hard you try, you will never be able to get it all done if you’re unrealistic with your time expectations. As a parent who wants to work remote jobs, get serious about time expectations. Figure out what your time limits are and embrace them. Then you can work to eliminate the things that are holding you back from reaching your personal and professional goals. Part of doing this is to gain clarity. Remember, you don’t actually need more time in a day. You need laser-focused clarity on what tasks and activities matter the most and the conviction to say “no” to everything else. When you do, it’s amazing how much more time magically frees itself up. Even after you have a handle on your time and realistic expectations in place, it’s up to you to put in the work to get everything done. When you work from home, there is no one else there to oversee your day. You and you alone are responsible to stay on task and put in a full day’s work, even when no one else is looking. As a telecommuting parent, this isn’t always easy. Fortunately, there are some tricks you can use to help you stay on task. As parents, we tend to be multitaskers by nature. We’re feeding our kids while doing a load of a laundry and answering texts from friends. And while we’ve been conditioned to think multitasking is a good thing, it actually derails productivity. Study after study shows that smart people don’t multitask. Instead, they focus on one activity at a time. When we focus on one task at a time we become more productive and more effective at what we’re doing. Multitasking, on the other hand, slows down our brain and derails progress. While it’s tempting to try to do multiple things at once, don’t! Focus on one thing at a time and your productivity will soar. A simple pen and paper can easily help you keep track of your day. Either the night before or morning of, make it a point to right down everything that needs to be done by the day’s end. Be sure to prioritize your list — place the most urgent at the top. That way, if you don’t make it through your entire list (and you probably won’t), you can move the unfinished tasks onto the next day’s list. Before writing your to-do list, always keep your time expectations in check. Don’t jot down everything you want to do that day. Instead, focus on those tasks that must be done. And don’t forget to cross off items as they’re completed! This simple act is gratifying and propels us forward to complete the next item on the list and so on and so forth. If a pen and paper aren’t your style, that’s okay too. There are a number of time management apps that fuel productivity and help you manage your day. I’m not going to lie, it is tough to balance a career as a parent, especially if you want to work remote jobs. Remember, working from home is not a substitute for childcare. You will still need to find distraction-free time to work. For you, that may mean freelancing around your kids schedule. Or perhaps you can swing part time work while the little ones are off to school. Whatever path you decide to go down, keep at it! A work from home job won’t just fall into your lap. It requires a plan to get from Point A to Point B. And, as always, if you have any questions don’t hesitate to ask. Leave your inquiries in the comments below or consider signing up for career coaching. You’ve got this!